The Samsung Galaxy Note 9 camera has similar 12MP sensors behind the telephoto and wide lenses. It can shoot 4K in 60 frames per second, but unfortunately, it's limited to 5 minutes of recording per clip at that resolution. If the user cuts that back to 1080p at 60 frames per second, the limit is increased to 10 minutes -- still far short of the iPhone. The iPhone XS Max, and basically every other iPhone is only limited by the available storage space, no matter what quality or settings you choose. We went out to Coeur d'Alene, Idaho and recorded a bunch of video footage so we could see how Apple's new iPhone XS Max performs compares to the Samsung Galaxy Note 9. The Note 9 can shoot in QHD (1440x2560) with the selfie camera, which looks more detailed than the iPhone XS Max 1080p selfie recording. However, video stabilization gets turned off on the Note 9 while recording in QHD, and the difference is noticeable. We also saw a pretty substantial difference in dynamic range. The iPhone XS Max does much better in this regard, maintaining the sky's color and detail. With the wide lens on the rear-facing camera, the iPhone XS Max did a lot better than the Note 9 in terms of video stabilization. By looking at the darkest areas of the trees in the background, we noticed better dynamic range on the iPhone XS Max. Not only that, but the sky retained more of its blue color, even though the Galaxy Note 9 image is obviously more saturated. The only complaint with the iPhone XS Max footage is the lack of contrast, making it look less detailed than the Galaxy Note 9's footage. With the telephoto lenses, both phones have a similar level of detail, but the extra contrast on the Note 9 looks better. We see pretty much the same results as with the wide lens in a telephoto test. Both phones do pretty well at dynamic range. However, if we take a look a the boats in the shade on the left side of the frame, the iPhone XS Max is able to lighten up the shadows better than the Note 9. One thing we noticed is that if you turn on AF Tracking on the Galaxy Note 9, video stabilization gets turned off automatically, making the Note 9's footage look substantially more shaky compared to the iPhone XS Max. On the iPhone, autofocus performance is exceptional, without needed to use a feature like AF Tracking. There's also no cases of certain features being disabled while using other features. Back to the test, the stabilization on the iPhone XS Max was outstanding. Doing the same stabilization test except recording in 4K at 60 frames per second, the Galaxy Note 9 performs noticeably better than the iPhone XS Max. We think it's because the AF Tracking mode is unavailable while shooting in 4K at 60 frames per second, so video stabilization may have automatically turned back on. While testing the stabilization, we noticed some autofocusing issues on the Galaxy Note 9. Occasionally, it would decide to focus on the background, even with a face right in front of it. The iPhone XS Max never lost focus on the subject. We then tested the autofocus by getting very close to a display case. Both phones tracked focus very well. When we backed up the cameras, the Note 9 went out of focus for a second, while the XS Max kept the focus locked in during any movements. We tested the dynamic range again, by filming the underneath of a patio umbrella against the side of a building which was in direct sunlight. For this test, we used the telephoto lenses and noticed more stabilization issues while shooting in 4K at 30 frames per second. The building was a bit blown out on the Galaxy Note 9, and the umbrella was darker than on the iPhone. So the iPhone XS Max was able to retain the highlight details, have brighter low-light details and it showed much more color in the sky compared to the Galaxy Note 9. Next up, we tested autofocus speed by placing a hand in front of the cameras. Here, the Galaxy Note 9 auto-focused quicker than the iPhone XS Max. We then decided to run the same test, except by quickly panning between trees in the background and a face in the foreground. At normal speed, it's hard to tell what's going on, but if you look at the individual frames, the iPhone XS Max was focusing on the face the instant it came into the frame. The Note 9 had quite a bit of lag adjusting the focus when compared to the iPhone. We first compared video quality while shooting in 1080p at 240 frames per second by kicking some sand into the air. We instantly noticed that the Note 9's image was extremely dark compared to the iPhone XS Max. There was hardly any detail at all in the pants and shoes. You might think that it was underexposed quite a bit, but if you look at the top of the frame, the reflection in the water is just as blown out as on the iPhone XS Max. The white balance on the Note 9 was noticeably too warm as well. The iPhone XS Max performed well in terms of dynamic range in this test, but we did notice some stabilization issues with it's footage. We tested the slow-motion capabilities by recording a fountain that was in direct sunlight. We first recording in 4K at 30 frames per second to show the normal speed, and we noticed much better dynamic range on the iPhone XS Max, since the water on the Galaxy Note 9's image was blown out. We then switched both phones to record in 4K at 60 frames per second. Both phones looked great, but the Note 9 was still blowing out some of the highlight details. When we switched both phones to 1080P at 240 frames per second, the dynamic range on the Note 9 got substantially worse, just like we saw in the kicking sand test. Not only are the shadows much darker, but the water seems to be even more blown out. Dynamic range got a little bit worse on the XS Max, but not nearly as much as on the Note 9. If you look closely, you'll notice that the XS Max has more detail in this mode as well. The Galaxy Note 9 also comes with a super slow-motion video recording feature. It's able to record at 960 frames per second in very short bursts between 0.2 and 0.4 seconds, limited to 720p. Dynamic range seems to stay the same as with the 1080p 240fps mode, but the quality takes a big hit. But on the other hand, the iPhone XS Max lacks a super slow-motion feature to that extent, so even the quality is low, it's still nice to have a feature like this on the Note 9. 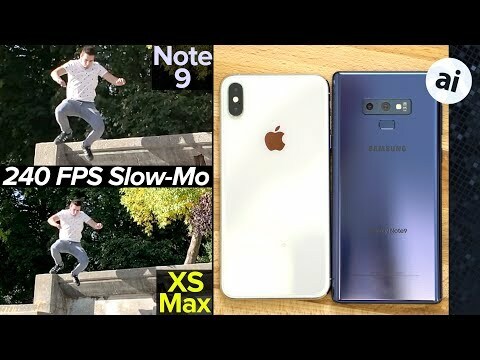 We decided to do one more test comparing 1080p 240fps on the iPhone XS Max versus the 720p 960fps super slow-mo feature on the Note 9. This time, I jumped off a ledge onto the beach. One thing we instantly noticed is that the Note 9's super slow-mo feature crops in a great deal on the frame, which is usually an indication of the processor or sensor not being powerful enough to record the full sensor at that many frames per second. The difference in detail was massive, but the dynamic range was just as good as on the XS Max. Despite the quality difference, the super slow-mo feature provided a more fun and interesting view compared to the XS Max. We then went indoors to test how both cameras performed in low-light. First, using the wide lens in 4K at 30 frames per second, the iPhone XS Max showed impressive dynamic range. The painting on the wall was exposed well, while the Galaxy Note 9 blew out some of the details. You can also visually see the difference by looking at the hot spot on the wall from the lamp. The darkest areas of the scene, including my face, are brighter on the XS Max. There's also a little bit less noise on the iPhone as well. To make it even worse for the Note 9, the white balance is way too warm, while the iPhone XS Max was extremely close to what we saw with our own eyes. Using the selfie camera, we saw more detail on the XS Max' image. However, there was less noise with the Note 9. We also noticed that some of the shadow details on the Note 9 were crushed, specifically the hair. Recording bright city lights near the end of the night probably shows the largest difference in dynamic range between both cameras. As you can see, the Comfort Inn sign is completely blown out on the Note 9, and the color appears to be white compared to the true-to-life blue on the XS Max. Even from a distance, you can easily read the word "Comfort" on the XS Max' image. Looking at the rest of the scene, it's easy to see the differences in dynamic range. One might argue that the Note 9 was exposed a tad bit brighter than the XS Max, but it's the camera software's job to properly look at the scene and adjust the exposure for the best results. Obviously, the iPhone XS Max was able to get the exposure just right. And once again, the iPhone XS Max more accurately represents the white balance that we saw with our eyes. Overall, the iPhone XS Max is the winner of this comparison, thanks to much better dynamic range, better color accuracy, better stabilization apart from 4K at 60 frames per second, better quality slow-motion capture, faster face detection autofocus and better low-light recording. Solid review, but again why XS Max and not XS? The camera systems and software are the same between the two models. There is no functional difference between the two in this regard. I preferred the sound of the audio recorded on the Note 9 over the XS Max. Found that strange, with Apple's expertise in microphone and speaker tech. The XS and XS Max have the same spec camera, so the results should be the same, no? One request to AI team on this camera comparison - Would you be able to do a similar comparison once Huawei's Mate 20 is available for comparison in a month or so? And I am not a fan of Huawei, by any stretch of imagination. The reason why I asked is - Huawei's P20 Pro got excellent reviews for its "low-light" capabilities which are just not available in ANY phone (including iPhones). Though it has its own share of weeknesses (particularly due to the AI features which make the results worser in most of the cases), the ultra low light photography is one area where Huawei seems to have innovated and taken it to the next level where everyone else (Samsung, HTC, LG etc and that list includes Apple) needs to catch up with. There are plenty of other sources that have or will compare the various models of phones against each other. I think that this is the configuration that Apple will choose when it adds a third lens, possibly next fall. Both did a very good job. Where the IPhone stands out is in stabilization and in low lighting. Man Apple is crushing it in the camera dept. AT&T added the Directv subscription requirement to get the “$700 off” deal a few days ago. You guys need to start mentioning that as it makes the deal a LOT less attractive. I haven't watched the videos, but in most of the photos, the iPhone seems better than the Samsung. The only 2 where the Samsung seemed to take better snaps were the Face Detection shot and the Autofocus shot. I'm really not sure if Vadim has more of the reddish tinge, as shown in the iPhone snaps, or more of the yellowish tinge, as shown in the Samsung snaps. While I’ve been critical of the XS Max stills performance as compared to the Note 9, it does seem to better said Note 9 when it come to video anyway, which is good.